VeryPDF PDF to Any Converter for Mac can easily implement the operation to convert PDF to JPEG (JPG, JPE), and hence, in conversion from PDF to JPEG, we call it PDF to JPEG Converter for Mac. PDF is a popular file format for storing electronic documents. It has the advantage to maintain the content and display effect as the same as the original on any display device. If you need to make preview thumbnails for your PDF files and then publish the thumbnails on the web, you may need PDF to JPEG Converter for Mac. 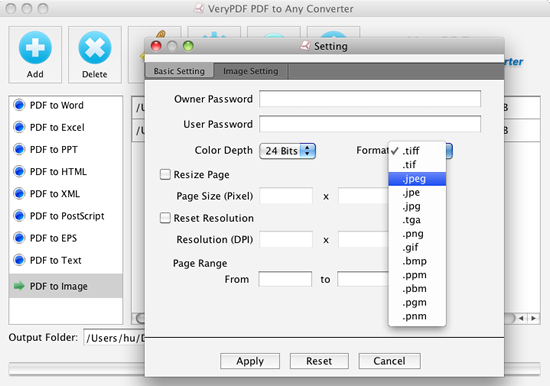 PDF to JPEG Converter for Mac is free for trial. You may download and install it for free. After installing the application, you may find it in the Applications of your Mac OS X system. Run the application, and then the interface will be displayed on the screen as shown in the following image. On the left panel of the interface, choose PDF to Image, and the application will be switched to mode conversion PDF to Image. Then click Setting in the interface to open the Setting dialog. The Setting dialog is displayed in the next image. In the Setting dialog, choose the Format as JPEG (or JPE, JPG) to set the target conversion format as JPEG. You may also set the page size and resolution for the converted JPEG images. The color depth is also customizable in this dialog. To convert only some pages of the input PDF files, you can set the page range and convert only those pages in the range. If the input PDF files are protected by passwords, you should input the correct password in the Owner or User Password to make sure that the application can access the content of the PDF files. Click Apply in the Setting dialog and return to the main interface. In the main interface, choose an Output Folder and then click Start. Then the application will convert the input PDF files to JPEG images and save the images to the chosen Output Folder. This application also has a Windows version and you may click the link to see the Windows version PDF to JPEG Converter.